This is a good example of the studies of figures in interiors, occupied by work or pleasure, at which the Oyens twins excelled. Echoes of Vermeer and Chardin resonate in their work; here, the subject does look indirectly back to Vermeer, with its side-lit room and reading woman, but it is also one in the long line of women painted with a book, going back to, for instance, frescoes of Sappho from Pompeii. Here, the catalyst is leisure rather than creation or piety; the woman is so absorbed in her novel that she has become a passive object in the still life of easel, vase and painting box, allowing the light to flow over the almost abstract shapes of skirt and sleeve, and her colouring to become part of the overall harmony. 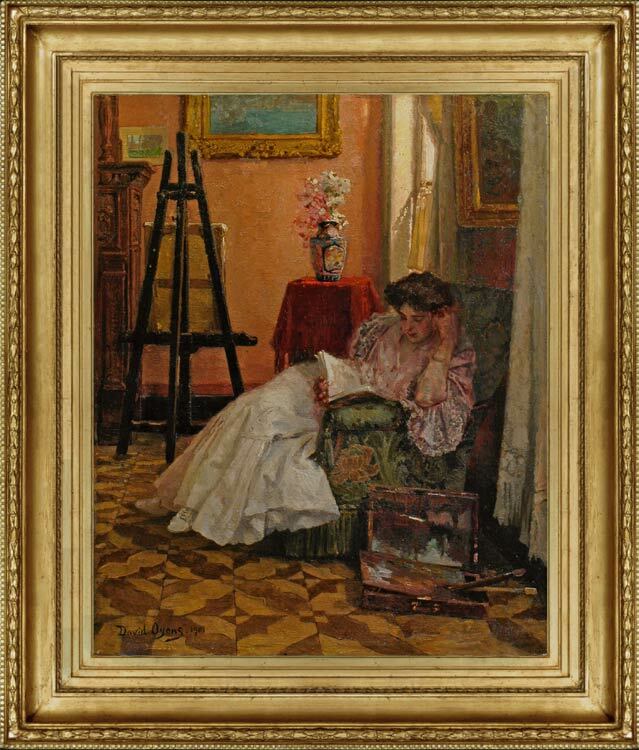 David Oyens (1842-1902) was a painter of portraits, interiors & genre scenes, and still life, who – like his twin brother Pieter – was born in Amsterdam, taught by Portaels, and died in Brussels. The Oyens twins were the sons of a banker, who reluctantly bowed to their talent and relieved them from following his own career. They moved to Brussels in the 1860s and shared a studio, sitting for each other and gradually each achieving great success; David won the Ghent Medal in 1880. They both exhibited at the 1889 Exposition universelle in Paris, where Pieter received an honourable mention. The twins were identical, David’s wife being unable to tell them apart; their work is also difficult to ascribe, save where signed with a Christian name, as it is so alike in technique, subject and style. The two were the subject of an exhibition, The Oyen brothers; twin painters, at the Gemeentemuseum, The Hague, in July 2008, from which this information is drawn; see Saskia de Bodt & Fred Hendriks, Een dag uit het leven van de gebroeders Oyens, 2008, Gemeentemuseum Den Haag. Works in public collections include Drawing, Gemeentemuseum, The Hague; The artist in his studio reading l’Art Moderne, 1884, and In the studio, 1883, both Dordrechts Museum.